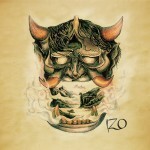 IZŌ is a instrumental stoner-rock band from Lecce, Italy, formed in 2013. After enduring a series of early line-up changes, they’ve crafted and released their self-titled debut. The opening track, ‘We Are What We Are’, is a great starter. You get little tastes of the doom, sludge, and stoner genres in a pleasing and palatable balance, but their main drive comes from a stoner/desert base. No issues with that at all, either. Also, while there are some approaches and textures in the music that may sound familiar to the listener, they offer some interesting atmospheric departures. I think this is one of IZŌ’s strengths, as is their intros and outros – the beginning and middle of ‘Hikikomori’ are good examples. The track ‘Kikusai’ also shows off a good blend of the heavy and the atmospheric about 5 minutes in. IZŌ’s guitar tones offer an unexpected and flexible beefiness: They pendulate between the distorted fuzziness of doom or stoner textures and the dirty cleans of post-metal. Multiple times throughout the album the guitars are independent, but build layers and textures together that make for full and busy songs. Their bass tone is good, too. It takes on a saturated, doomy, beef-tone but also stands out well with a chorused and clean delivery, where appropriate. IZŌ have some psychedelic noises and soundscapes that have been tastefully added to their songs, not taking away or overpowering at any point. I feel there could be more, too. I like that stuff. Although I feel their drums could have more boom to them, I think they’re mixed well. What I really enjoy about this release is that all of their instruments feel measured and balanced – in each performance, not just the final mix. Nothing seems to be getting away from them, nor is anyone in the band trying to do too much or stand on their own. I think this is another strength of theirs. This being said, I think there were some opportunities. For instance, some fantastic buildups were followed by riffs that either didn’t seem to deliver or feel like a good fit. In spaces where the music started to breathe a little, I was expecting something to jump in front of the mix once the foundation was established. Often, that just didn’t materialize – but when it did, I felt something definitive was lacking. An example of this is around 5 minutes into ‘Hikikomori’. So, while I feel they are very well-balanced in regard to their tone and style, I think their songwriting has some room for growth. I see a greater potential in future releases. They’ve laid a strong foundation in their self-titled release, having created a balanced style from a host of influences and tastes. It results in a coherent and pleasing listen for their first recording. I hope to see and hear more of them in the future.